This tennis hall is pleasantly heated by means of six Infra 20-6 radiant heaters. These black tube heaters are 6 meters long and have a power of 16.3 kW each. The gas-fired radiant heaters heat up without displacing air and produce little noise. Due to the short heating time of the Infra and the lower room temperature, the system works very economically. 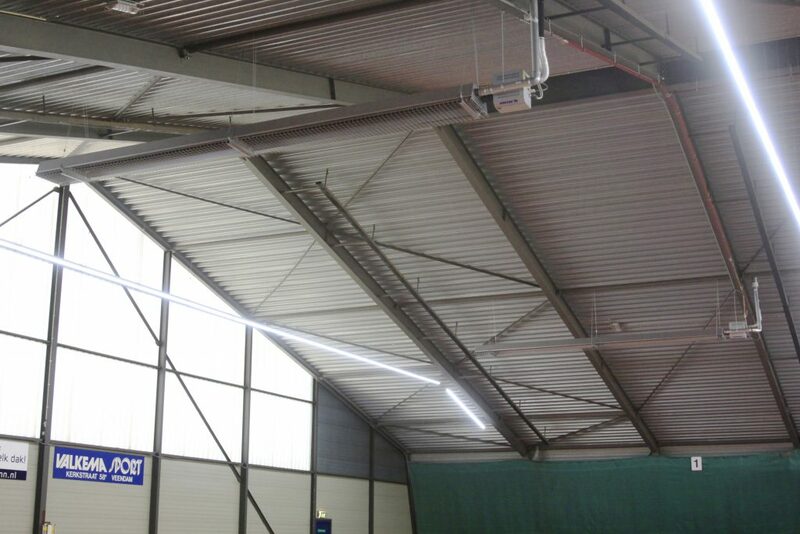 Thanks to the Mark Infra Zone Control it is possible to switch on the radiant heaters of the tennis hall per runway. As a result, the heat is only obtained at the location where it is needed. For use in sports halls it is possible to provide the Mark Infra’s with ball protection grids. The Mark Infra is available in various capacities from 10 to 200 kW with lengths from 3 to 147 meters.